1.1 This Standard Radio System Plan (SRSP) states the minimum technical requirements for the efficient use of the frequency bands 6590-6770 and 6930-7125 MHz by one-way line-of-sight radio systems in the fixed service to provide television auxiliary services. 1.2 This SRSP is intended to be employed in the design and specification of radio systems and equipment and in the evaluation of technical applications for new radio facilities or modification to radio systems submitted in accordance with the current issue of Radio Standards Procedure-113 ( RSP 113 ) and/or other appropriate procedures. 2.3 When potential conflicts between radio systems cannot be resolved by the parties concerned, the Department should be advised, and after consultation with the parties concerned, it will determine the necessary modifications and schedule of modifications to resolve the conflicts. 2.4 Although a radio system conforms with the requirements of this SRSP, modifications may be required to the system whenever harmful interference1 is caused to other radio stations or systems. 2.6 The arrangements for non-standard systems are outlined in SP-GEN, " General Information Related to Spectrum Utilization and Radio System Policies ". 2.7 It should be noted that the fixed terrestrial service shares this band with other services in accordance with the Table of Frequency Allocations 9 kHz to 275 GHz . 3.1.1 SP 306.5 - Spectrum utilization policy for the Fixed Service in the bands 6590-6770 and 6930-7125 MHz . 3.1.2 SP-GEN - General Information Related to Spectrum Utilization and Radio System Policies . 3.1.3 Radio Standards Procedure 113 (RSP-113) - Application Procedures for Planned Radio Stations above 960 MHz in Terrestrial Fixed Service . 3.1.4 Telecommunications Regulation Circular 43 (TRC-43) - Notes Regarding Designation of Emission (Including Necessary Bandwidth and Classification) Class of Station and Nature of Service . 3.1.5 Table of Frequency Allocations 9 kHz to 275 GHz - available from Canadian Government Publishing Centre, Supply and Services Canada, Ottawa K1A 0S5, Canada. 3.2 The above documents are available on request from the Department of Communications headquarters in Ottawa or regional offices of the Department located in Vancouver, Winnipeg, Toronto, Montreal or Moncton. 4.1 Permanent single-hop radiolinks carrying television video signals performing the functions listed and defined in paragraph 4.2 may be licensed in the 6590-6770 MHz band. TV-studio-transmitter Links (STL) - A fixed radio-communications system used to relay television program material and related communications from the studio to the transmitter site of a television broadcast station. TV Off-air Pickup-rebroadcasting Transmitter Links - A fixed radiocommunications system used to relay television program material from an off-air pickup site to the transmitter site of a television rebroadcasting station or to a CATV headend. TV Inter-studio Program Links - A fixed radiocommunications system used to relay television program material and related communications between a remote studio and the principal studio of a television broadcasting station. This would include back-haul links from remotely-located satellite TVRO Earth stations to television studios in order to avoid terrestrial interference. CATV Studio-headend Links -A fixed radiocommunications system used to relay television program material and related communications from the CATV studio to the CATV headend. 4.3 Frequency Allocations - There are nine RF channels available in the band 6590-6770 MHz for such facilities as shown in Figure 1 and Table 1. These channels are intended for one-way, single channel links and are normally restricted to one hop systems. 4.4 Frequencies above 10 GHz or non-radio alternatives should be considered wherever possible, for any link whose path length is shorter than 16 km. Note- The use of RF channels 1 and 9 will necessitate close coordination with systems operating on adjacent channels in the frequency bands 6430 to 6590 MHz and 6770 to 6930 MHz (SRSP 306.4) used by high capacity systems. 4.5 Selection of Frequencies- No specific radio channels have been designated to any particular television station channel. The Department's normal policy is to assign an available channel or channels without frequency diversity protection to a facility in a given area. This channel may be assigned to more than one system in the same area when this is feasible. 5.1 The transmitter power delivered to the antenna input for each RF channel shall not exceed 1 watt (0 dBw). 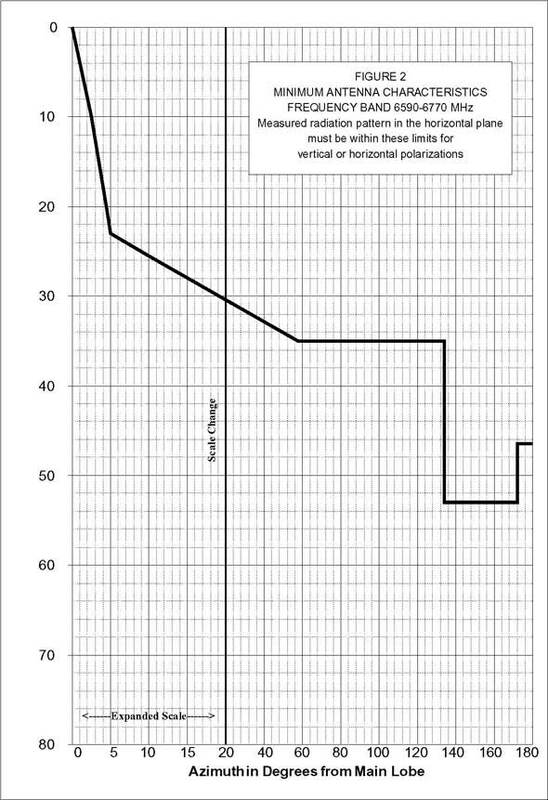 5.2 An increase in transmitter power over the above specified limits may be permitted if technical justification is provided. In no event will the power delivered to the antenna be permitted to exceed 10 watts (10 dBW) per RF channel. 5.3 The transmitted frequency shall be maintained within ± 0.02% of the assigned frequency. 5.4 All significant emissions from the transmitter shall be contained within the necessary bandwidth calculated in accordance with Telecommunications Regulations Circular 43 ( TRC-43 ). The licensed necessary bandwidth (video,audio and subscriber channels) shall not exceed the channel spacing of 20 MHz. 5.5 For FM systems,the maximum peak to peak deviation of the RF carrier by composite video baseband signal shall not exceed 8 MHz. Sub-carriers with sound program channels may be multiplexed with the video signal. The carriage of AM/FM STL's as a sub-carrier of TV STL's will be encouraged in order to conserve spectrum. The smoothed horizontal directivity pattern of the antenna for both E and H fields with vertical or horizontal polarization must remain in the envelope shown in Figure 2. The Department may require the use of antennas with better discrimination to ease coordination problems. 7.1 The maximum equivalent isotropically radiated power (e.i.r.p.) from the antenna must not in any case exceed + 55 dBW per RF channel. 8.1 As far as practicable, sites for transmitting terrestrial stations operating in the fixed service, and employing maximum values of e.i.r.p. exceeding +35 dBW in the frequency band 6590-6770 MHz should be selected so that the direction of maximum radiation of the antenna will be pointed at least 2 degrees away from the geostationary satellite orbit, taking into account the effect of atmospheric refraction. +47 dBw to +55 dBw, on a linear decibel scale ( 8 dB per degree), in any direction between 0.5 degrees and 1.5 degrees of the geostationary satellite orbit taking into account the effect of atmospheric refraction. 9.1 Definition: This type of service is intended for the direct pickup of television programs for transmission to a television broadcast studio or to a CATV headend, and also for temporary TV links. 9.2 For TV pickups, frequencies above 10 GHz will be used wherever possible for the camera to mobile studio link and either the 2.5 GHz or this band for the link from mobile studio to main studio. 9.3 There are ten RF channels available in the band 6930-7125 MHz for such facilities as shown in Figure 1 and Table 2. 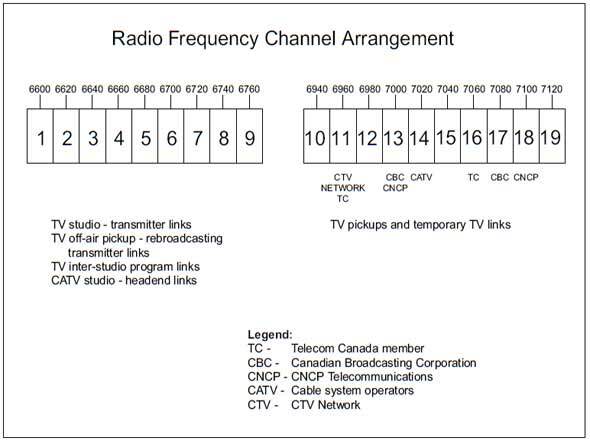 9.4 Selection of Frequencies-Certain RF channels have been authorized for use across Canada to specified organizations as shown in Table 2 and unless specific alternative arrangements are made on a local basis the use of these RF channels is limited to the above-mentioned organizations. Independent television broadcasting stations are authorized the use of channels on a case by case basis on request to the Department. Temporary systems using one or more hops may employ RF channels 10 to 19 subject to availability of compatible frequencies, mutual agreement between the applicant and the prime user concerned and the approval of the Department. Note: The use of RF channels 10 and 19 will necessitate close coordination with systems operating on adjacent channels in the frequency bands 6770 to 6930 MHz ( SRSP-306.4 ) and 7125-7725 MHz ( SRSP- 307.1 ). 10. Transmitter Characteristics - Refer to Section 5. 11. Antenna Characteristics -A directive antenna with a horizontal beamwidth between half power points of 5 degrees or less shall be used at fixed and/or transportable transmitting and receiving stations. 11.1 In order to avoid interference with satellite systems, the EIRP of TV pickups and temporary TV links will be limited to 47 dBW. (b) significantly degrades or obstructs, or repeatedly interrupts, the use or functioning of radio apparatus or radio-sensitive equipment. Illustrates the radio frequency channel arrangements from tables 1 and 2. The y-axis measures antenna directivity in dB down from main lobe from −80 to 0. The x-axis plots azimuth in degrees from main lobe from 0 to 180. There is one plot line, which ranges from −53 to 0 on the y-axis. Data points on the plot line include: 0 dB at 0 degrees, −23 dB at 5 degrees, −30 dB at 20 degrees, −35 dB at 58 degrees, −35 dB at 134 degrees, −53 dB at 134 degrees, −3 dB at 172 degrees, and −46 dB from 172 to 180 degrees. Measured radiation pattern in the horizontal plane must be within these limits for vertical or horizontal polarizations.